Little Downy Woodpecker Still Roosting In Our Bird House On Cape Cod! It is such a treat to have this little guy greet me each day. He stays for a bit and looks around and then heads to the suet. Not a bad life… free room and board and free baths and water. Maybe he’ll stay a while longer. Sure hope so! Previous PostWinter At Rock Harbor On Cape Cod.Next PostUsing The Beaufort Wind Scale On Cape Cod. I love the thought of him tidying up inside his house before he goes out in the morning. Hmm…a children’s nature book? or article? Hmmm… that would be cute!! 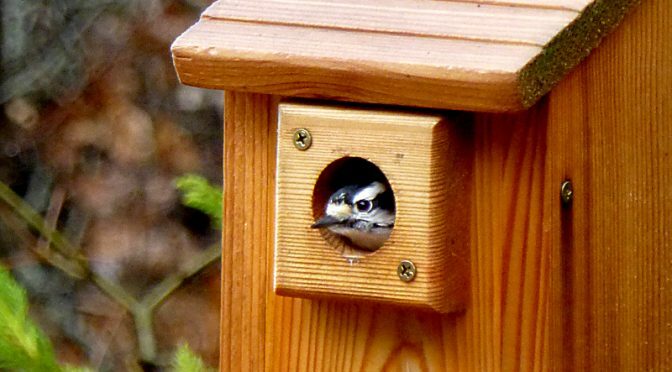 Sweet photos, true-to-life narrative with some downy woodpecker facts. Could be a fun project ! Love it! Let’s talk sometime! !